SCVHistory.com | Pico Canyon | Hughes Claim: Medium Helps 'Spiritualist' Strike Oil in Pico, 1865. 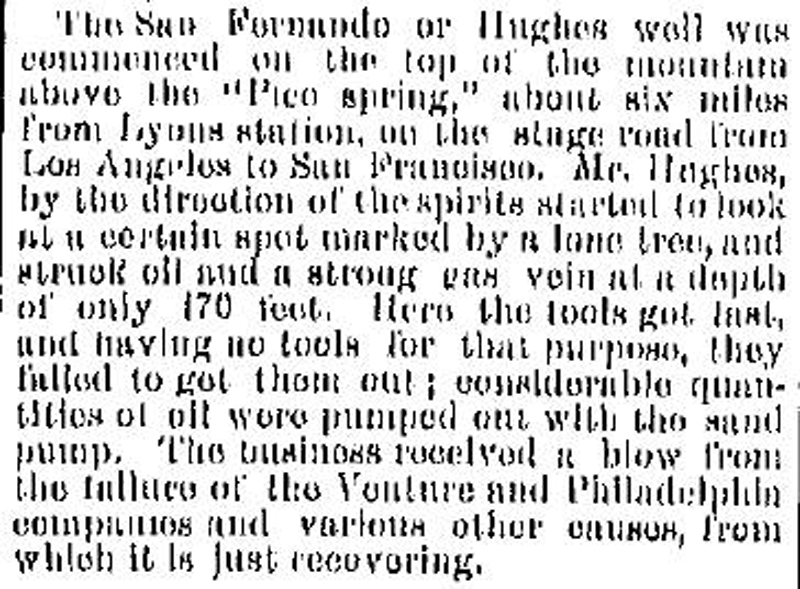 Hughes Claim: Medium Helps 'Spiritualist' Strike Oil in Pico, 1865. Local historian Stan Walker writes: One of the unknown men of Pico Canyon was Mr. Hughes. I have seen his name as both F.J. Hughes and M.F. Hughes, and sometimes misspelled "Hewes." We know there was a Hughes Spring in Pico Canyon, but we don't know exactly where it was. Hughes Canyon is on some early maps as a tributary to Pico Canyon, emptying in from the south at Johnson Park, so the spring might have been somewhere up that creek. Hughes was superintendent of the San Fernando Petroleum Co., incorporated July 5, 1866. We know he used a spring pole to drill a well in 1866 and that the tools would become stuck in the well. By 1877, the Hughes claim was owned by the San Francisco Petroleum Co. Hughes was evidently dead by 1877. Of note, Hughes used a medium to help him decide where to drill, if we can believe the stories below (and I see no reason why we shouldn't believe them). 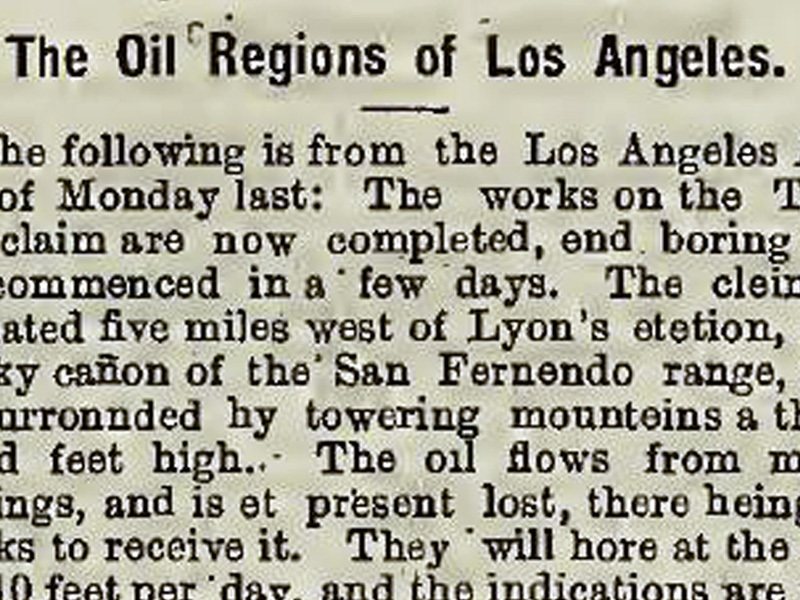 The Oil Regions of Los Angeles. Mining and Scientific Press | July 25, 1874. The following is from the Los Angeles Herald of Monday last: The works on the Temple claim are now completed, end boring will be commenced in a few days. The claim is situated five miles west of Lyon's station, in a rocky cañon of the San Fernando range, end is surrounded by the towering mountains a thousand feet high. The oil flows from many springs and is at present lost, there being no tanks to receive it. They will bore at the rate of 10 feet per day, and the indications are that they will get a flowing well within 400 feet. The show of oil upon the surface is very great, and without any work having been done to develop the springs. The oil refined at Lyon's station shows that it is of a superior quality, and non-explosive. The well sunk on the Wiley claim some years ago, although only 100 feet deep, flows a continuous stream of oil, which is now lost, however, there being nothing to save it in. The Moore spring and the Pico spring are now being developed, and show flattering prospects. The line of the Southern Pacific railroad passes within three miles of the oil springs, and it will be easy to transport the oil to market. The history of the Hughes claim is a singular one. In 1865 Mr. Hughes, the owner of the famous Hughes claim, being about to bore for oil, and being a strong Spiritualist, applied to a medium to indicate the spot where he would probably find oil. A certain spot was indicated, and, after boring 150 feet, a flowing well was struck, the oil being of the finest quality; but, unfortunately, at the moment of success, the boring tools got fast and it was impossible to extricate them. Several efforts have since been made to extricate them, but have failed. Wood and water are abundant in the immediate vicinity. It would be a delightful resort for tourists — among the forest-clad mountains and romantic cañons. Game is abundant, and this is truly the home of the honey bee. A bee cave was discovered here a few days ago, in which there can be seen 24 layers of honey. The famous cave discovered some years ago, which is supposed to contain a ton of honey, is truly an object worth seeing, the swarm of bees constantly passing in and out of the cave being immense. A beautiful waterfall, 100 feet high, has been found here among the pine mountains. It is surrounded by pine trees 100 feet high. Petrified wood and many natural curiosities abound in this region. Titusville Morning Herald | October 8, 1874. The San Fernando or Hughes well was commenced on the top of the mountain above the Pico spring, about six miles from Lyons station, on the stage road from Los Angeles to San Francisco. Mr. Hughes, by the direction of the spirits, started to look at a certain spot marked by a lone tree, and struck oil and a strong gas vein at a depth of only 170 feet. Then the tools got fast, and having no tools for that purpose, they failed to get them out; considerable quantities of oil were pumped out with the sand pump. The business received a blow from the failure of the Ventura and Philadelphia companies and various other causes, from which it is just recovering. Titusville Morning Herald | January 9, 1877. San Francisco Petroleum Company's Well No. 2 is located on a spur of the range, about 300 feet above the creek level at Pico oil spring, and some 1,200 feet distant there from. It is on a line running due east and west from the Moore well and Pico spring, and about thirty feet above Hughes' well, about which there is a history which may be as well told now as again. A man named Hughes, who had been in Pennsylvania in the early oil days, emigrated to California, and when the Pico oil discovery was made he located a well at this point, in line with it. About the year 1866 he began operations, and in a single year a hole was drilled by a spring pole to a depth of 203 feet. There was no road up the canyon at this time nor for several years after. Everything had to be carried up an oil trail on a man's back, which made the cost of sinking very heavy. At the 203 foot level an oil streak was penetrated, but the tools were unfortunately lost. Hughes' associates in the venture would not subscribe any more capital, and he was without means. The creditors seized and sold the plant, and the well has stood idle ever since. There are some fifty feet of nice green oil in it at the present time. If Hughes had lived till now he would have seen his old location occupied by a company of California capitalists, who are not to be deterred by trifles, and the best boring plant in California in full operation on it night and day. Thus, the location of the San Francisco Petroleum Company's well No. 2 was in part proved years ago, justifying the choice.